Up to a month before the biannual conference of the International Society for Industrial Ecology, I hadn’t heard of this field. In the early days of industrial ecology, investigation of the soundness and utility of the biological analogy and efforts at eco-design were prominent. In the past decade, input-output analysis (especially multi-regional IOA), studies of resource criticality, integration of social science and operations research, agent-based/complexity modeling, urban metabolism and long-term socio-ecological research have become central to the field. The way I came to Industrial Ecology was by another route. While doing research in June, I encountered a 2001 book, Construction Ecology: Nature as a Basis for Green Buildings, edited G. Bradley Guy , Charles J. Kibert and Jan Sendzimir. Here’s an extract from the table of contents. The book followed from a “Rinker Eminent Scholar Workshop on Construction Ecology and Metabolism” at the University of Florida in 1999. I was intrigued that of the four “ecologists”: (i) I’ve met all four in person; (ii) two were ISSS presidents (i.e. Odum and Allen); and (iii) two were speakers at the ISSS San Jose 2012 meeting that I organized (i.e. Allen and Peterson). Howard Odum and James Kay has both passed, so I’ll have to read their legacies to learn. Tim Allen is in Wisconsin, and fortunately welcomes researchers who want to visit him. One way that I learn rapidly about a field is to attend a conference where current research is presented. The ISIE runs its conferences biannually. The choice to go was either then almost immediately (i.e. July 2015), or in two years (July 2017). The 2015 theme was “Taking Stock of Industrial Ecology” where “plenary speakers and panels will give reviews – both retrospective and prospective – of different aspects of industrial ecology”. For a beginner, this was enticing. A quick check of airfares made the trip feasible, so I went (with a fortunate routing through Austria for Purplsoc bringing down the cost even more). 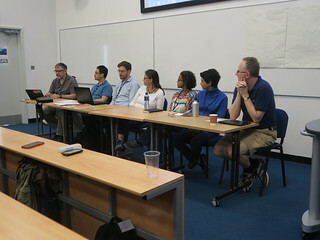 The Wednesday morning had plenary session reviewing the core of work in industrial ecology over the past decade. On Thursday morning, the talks emphasized research under recent development. 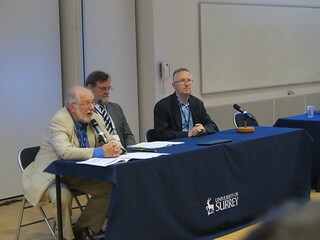 In the afternoons, and for all of Friday, there were parallel sessions scattered over four buildings on the University of Surrey campus. On the Saturday morning, there was a Symposium on Industrial Ecology for Young Professionals, which I attended as a graduate student. Attending five days at the conference fulfilled the expectation that I would be immersed in the current body of knowledge in industrial ecology. A 550-person conference is larger than the meetings I normally attend. The conference attracted a lot of international attendees, as well as good representation from the UK. More attendees from industry would be welcomed, as was the original mix in the founding of the society. I expect that I will spend some time with the Taking Stock of Industrial Ecology open access book when it’s published, when I should be at leisure to reflect on the material. There’s a feed from the Journal of Industrial Ecology that I’ll also be tracking.